The Emerald Ash Borer (EAB), a non-native insect pest that kills all species of Ash trees, has now been found in Princeton as well as in surrounding counties. 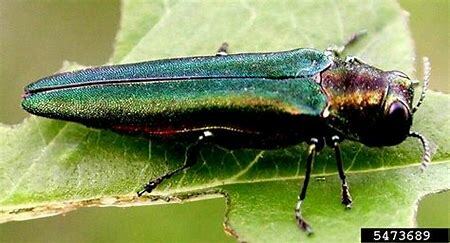 This highly destructive insect has killed millions of Ash trees including many trees in our area. Princeton has formulated an EAB management plan for its approximately 1,800 Ash street trees; the plan includes tree removal and selective treatment. There is growing evidence that the White Fringetree is infested by the EAB as well. IDENTIFY Ash trees. Ash species have opposite branches and leaves and a compound leaf with 5-11 leaflets. The bark on older trees has a unique diamond-shaped ridge bark, but younger trees may have smoother bark. Click here for images of an Ash tree and Ash tree look-alikes. MONITOR your Ash trees for the Emerald Ash Borer. You will know when the risk of mortality becomes urgent. Look for dying branches at the top of the tree, woodpecker damage, galleries under the bark, d-shaped holes, bark splits, sprouting at tree base and along trunk and green adult beetles. USE TRAPS to detect the Emerald Ash Borer in your community or woodlot. If the Emerald Ash Borer is in the area, it will be attracted to these purple prism traps. To determine the health of your Ash trees, consult Assess Ash Trees for Emerald Ash Borer. Click here To view the STC criteria that will help you decide whether to remove an ash tree or treat it. Click here To consult the Managing Emerald Ash Borer Decision Guide. Click here For insecticide treatment options to protect ash trees from the Emerald Ash Borer. Click here For FAQs regarding potential side effects of EAB insecticides. Click here To view the 2016 amendment to the Princeton Trees and Shrubs ordinance that exempts ash trees from some requirements of tree removal permits. Click here To watch the STC's June 23, 2016, publicinformation session on the Emerald Ash Borer, videotaped by and courtesy of Princeton TV. For up-to-date EAB information, consult the Emerald Ash Borer Information Network. For New Jersey, consult the NJ Department of Agriculture's EAB website. New Jersey Department of Environmental Protection (NJDEP) State Forestry Services website. www.aphis.usda.gov The United States Department of Agriculture. www.na.fs.fed.us/fhp/eab The United States Forestry Service web page on the EAB. You can adopt an ash tree or contribute to the STC Fund to Save Ash Trees. Click here to download the STC Contribution Form. The Spotted Lanternfly, Lycorma delicatula is a new pest to the United States. This invasive plant hopper, initially discovered in Berks County, Pennsylvania in 2014 is native to Southeast Asiaand poses a threat to forests, ornamental trees, orchards, vegetables, grapes,hops and other agricultural commodities. Since its initial discovery in Pennsylvania it has spread to infest portions of 13 counties of that state,recently it has been discovered in New Jersey in Warren, Hunterdon and Mercer Counties. The New Jersey Department of Agriculture has recently enacted a state quarantine in these counties to restrict the movement of this insect to un-infested areas of the state. All other life stages of this insect,from nymphs to adults can fly, hop, or drop right into or onto vehicles –meaning that vehicles and equipment can easily and quickly help it spread.